As City prepared to take on Everton and match-goers battled Manchester’s traffic on a night of transport chaos, news poured out of another potential January target. And this one appears to have credibility, with multiple sources sharing similar information. 20-year-old defensive midfielder Julian Weigl has been a revelation for Borussia Dortmund this season, after joining from 1860 Munich for a bargain €2.5m last summer. With an impressive passing range and accuracy of 92%, Weigl has really shone for Thomas Tuchel’s revived Dortmund side. And it is City who head the queue for his services, if tonight’s reports are to be believed. Sky Sports UK first revealed news that City are preparing a £19m bid for the Germany U21 international, and that was quickly followed by similar information from their German colleagues. It’s possible the two Sky offices traded the same information, so Sport Bild following up with their own ‘exclusive information’ added serious legs to the rumour. Sport Bild’s article mentions Pep Guardiola as a huge admirer of Weigl, adding that he criticised Bayern for not snapping him up before Dortmund. Their less than subtle suggestion is that Weigl is a talent identified by Guardiola for his future City team. Like Sky, Sport Bild report that a deal of near £19m (€25m) is under discussion and has not been ruled out by Dortmund. Dortmund would hate to lose such a talent after half a season, but a quick profit of €22.5m would be great business. 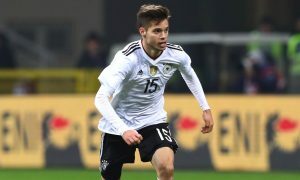 Weigl is named as a replacement for Yaya Toure by the German media. Physically he is far less imposing, a fairly slight player, but technically he looks to be of a very high standard. Many name-drop big athletic midfielders to replace Yaya, but it is his technical ability and passing range that City must look to replace. And if Pep Guardiola is to arrive, an energetic young talent like Weigl could be perfect for a new-look City midfield.